The newbuilding BERLIN went into operation May this year, four years later than originally planned. Following this autumn, her coming fleet mate, the remaining fifty procent of the much-needed tonnage renewal and expansion on the Gedser-Rostock-route, COPENHAGEN will join in, Scandlines announce. It was miscalculations and use of over-dimensioned steel plates, among other things at the shipyard, that led to the extensive delay. If not dealt with in a very radical way, Scandlines would have ended up with two newbuildings comprising way too high lightweight, resulting in way too low payload capacity, if not the tight draught restrictions in the Gedser fairway should be exceeded. In the radical approach to slim the ferries, the whole superstructure over the trailer decks was entirely redone. Partly downsized and partly rebuild in lighter steel dimensions, giving the duo a completely new profile much different from the intended exterior. Conservative with the now obviously references to Scandlines’ pedigree in Danish and German state ownership with distinct-looking (less commercial-/smart-looking) ferries, in the past – very different from the ones operated by private companies. Clean with simplicity of the very slimmed superstructure. Especially with the white wedge-shaped funnel, and seen from port, the nearly undisrupted row of windows. On the tech-side the project has from the start of been very ambitious laid out. First of all in order to optimize the propulsion-line to the complex operation between Gedser and Rostock covering huge depth variations and a tight two-hours timetable demanding a relative high service speed. None of the problems higher up has caused any reductions in the tech department low in the ships. On the contrary the long delay has also been used to implement the gained experience and know-how from the well-off implementation of diesel hybrid electricity operation on Scandlines’ other Denmark-Germany route, into the Gedser-Rostock pair. 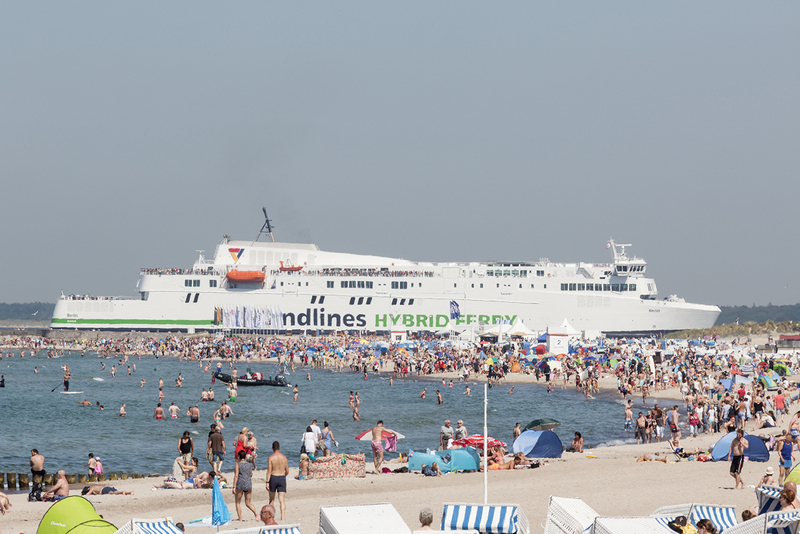 Understandably Scandlines has wanted to draw the public attention to that, as the company now is a world leader in the usage of battery power on big ferries. The huge “HYBRID FERRY” in green capital letters continued with a likewise green line, plays an important role in the exterior. The same does the funnel, but in a more subtle way. A “green ship” doesn’t need a huge funnel, which can even be kept in all-white!